New grow beds finally done. 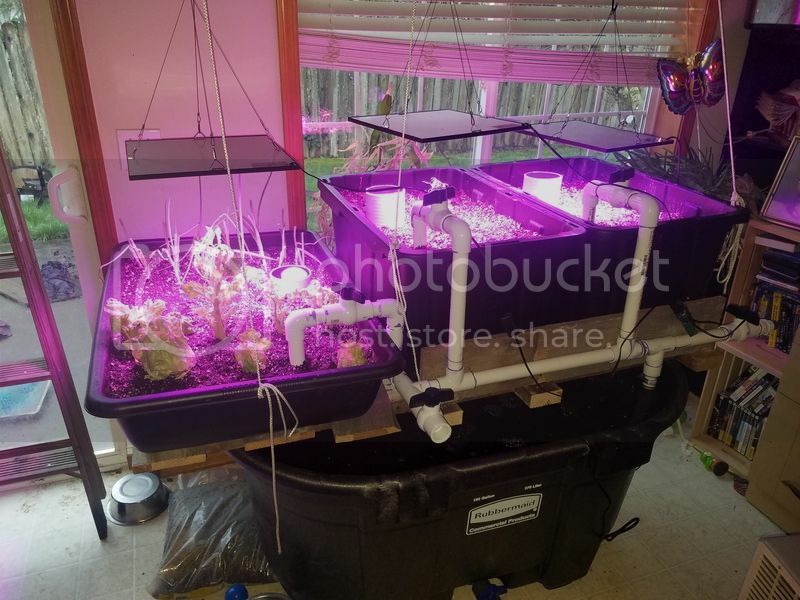 Finally got my eb and flow grow system together. Have some salad leftovers in the shallow tray. Going to grow some tomatos, peppers, and a couple vines in the 2 totes. The system is running well. Did have to dig out one tote, and a bit of the tray after a few days of running. Got some kind of backup at the feed pipe. Had water flowing up the side of the pipe, then out and down through the bed. I think the pipe just wasn't deep enough in the lava rock. After i dug into it, i did notice the feed pipe in the tray was right at the boundary between the lava rock and perlite. Made the feed pipes longer, and put a T fitting on the end. Sitting about 1/8" above the bottom of both now. Get great flow through the bed even with the valves fully open. Re: New grow beds finally done. Thanks. Hopefully i dont have any more failures for a while. Worked yesterday. I'll try and make a new link. Edit : apparently not. Photobucket messed up the original post. Cant get drive to work on this. Grr . I've seen it all along. Still see it. It fixes it so you can see pictures at PhotoPuker if the pics haven't been deleted there. Yea I could choke them people. cool ! good info to have. thank you.